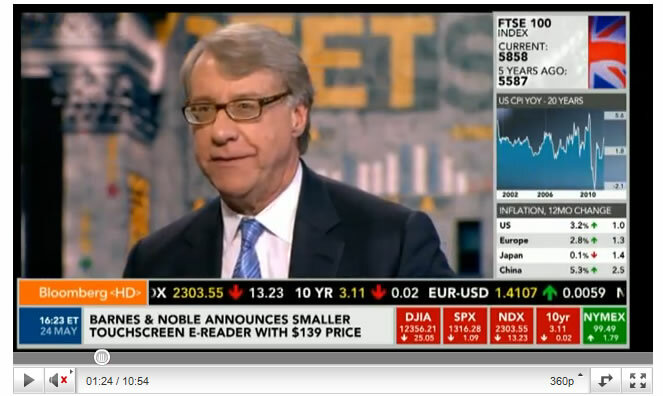 Legendary short seller Jim Chanos of Kynikos Associates appeared on Bloomberg Television this afternoon with Carol Massar and Matt Miller. Chanos said that his "dramatic" bet against Chinese real estate may not be bearish enough and that "the bubble is really on the other side of the world." "Lately, I have been taking a beating from some Chinese real estate developers including one very recently…These kinds of criticisms, these ad hominem criticisms are fine, but what people again don't seem to be attacking are the facts. The property developer stocks that we're short have been declining. This has been a good place to be short for the last 18 months. I guess we can rest on that." "Actually, our team just got back from China, my research team." "I don't ever talk to companies or CEOs anyway. I have not for 25 years…I think that what my team found [in China], they actually came back saying we are not bearish enough." "The signs of overcapacity were much even greater than their last visit, which was late last year. Increasingly, the executives that they met with were sounding a little bit more uncomfortable about the current situation." "If you look at the balance sheet of the developers that claim they are pre-selling…If you look at the balance sheets of the developers, you'd be hard-pressed to see how healthy they were because they are all loaded up with land, just as our developers were at the top of our market. So for every yuan that they are earning presale, they are plowing it back and then some into new land development. They are drinking the Kool-Aid, so to speak." "We've maintained our pretty much dramatic overweight in our Chinese shorts, and we will leave it at that." "What we are seeing now is more cracks on the façade and what they observed, almost quite literally. The buildings that were only two to three years old were already beginning to show some signs of wear and tear…The quality of all this fixed asset construction is becoming sort of suspect." "I think this is actually one of the reasons contributing to the bubble in that it is a double edged bet that could turn into a double-edged sword. Investors are counting not only on asset appreciation of fixed assets in China, but they're counting on the yuan being revalued upward. If it ever became apparent that might go the other way, you could see a real scramble to get out of these assets in China." "We have a hedge fund. We have a small, long short opportunity fund, which is a fraction of the size of our total holdings, and in that fund, we hedge off everything. We were short a bunch of developers, individual developers. We hedged it off on the long side with an ETF. We are not bullish. We're just hedging in our hedge fund." "In our hedge fund, which is a small part of our assets, a couple hundred million, less than 5% of our assets, we have longs and shorts. To use the China example, not only are we hedging with the ETFs on the long side, but we own the debt of some of the developers against short positions in their stocks…Increasingly, the real estate developers can't get bank loans for their project financing in China. They're now going into the Hong Kong market to raise money in the bond market at very, very high rates, as high as 15%, 20%." "That's the problem in any IPO, so we stay away from that because you can't borrow them." "But that also goes to show you why you need short sellers in the marketplace sometimes to produce price discipline when things get out of hand on the upside. When you can't borrow the shares, you get an important group of investors who are willing to risk capital to say this is silly and can't participate. Typically what happens is as soon as these stocks become borrowable, that's when they go down." "We are not finding that much [interesting]. We owned a lot of fixed income securities back in the end of 2008, early '09. Now it's also more passive hedges on the long side, versus active shorts in our hedge fund…I think as every month goes by, we're finding more and more to do in the U.S. market on the short side. That wasn't so much the case a year, a year and a half ago." "[The tech market] today, it's not like '99 and '98. It is different. As I said, the bubble is really on the other side of the world….I'm not comfortable with it, I would never own [LinkedIn]." "The Chinese is our biggest area, people know that. We're still in the for-profit education area, broadly speaking. We think that has not played out yet…In an era of looking at budget austerity in the U.S., I can't believe that when staffers in the House and Senate look at how much these companies are costing taxpayers in terms of student loan defaults, they're not going to look at it through a different prism." "We covered most of our healthcare shorts after we looked at the healthcare bill, which I think was a bigger lost opportunity for Washington than the financial reform…When it was all said and done, the sausage that came out of the grinder was in fact an enhanced coverage bill that was going to increase costs." "Obviously, as market participants, we have to pay attention to it." "I think this is all about trying to protect the valuations by largest European banks have on their sovereign debt holdings, and at some point, the voters in these countries are going to figure out that, in effect, their taxpayer dollars in western Europe are going to support the banking system, much like ours did a few years ago." "Our situation is much different. We are a reserve currency country which gives us tremendous flexibility, and that helps us to an extent like no other, and our situation is certainly more agile than Greece and some of the other ones, but having said that, the long-term picture for our country is dismal if you look at our accounting." "We realize we are pessimists. Submissions are going to be left to somebody else, but the problem is health care spending. End of story. It is health care. Health care is the lion's share of our unfunded liability. Unless we get control of health-care costs, which continue to grow, I just saw some numbers last week, 6% or 7% above the real economy, we are going to be consumed by it. At some point, something will give on that front." "We were talking about munis a long time ago. What Meredith said, the old saying is that you can predict one or the other but not both. Having said that, I think she underscored at a time when there was a lot of complacency, particularly a lot of retail investors who do not do their own fundamental work, and they hold a myriad of different obligations, and they really do not know what they own. At the time that she spoke, which I believe was October or November of last year, spreads were very, very tight, and people were not being compensated for the risk that they took. So in that respect, I think she did the market a favor as much as she was crucified by others for saying that, but I read her report and I thought it was brilliant."